Houston—Who would have thought that the humble pizza could be an icon of innovation? “It’s strategic; we realize going after all food types is not efficient,” he says. Plus, nearly everyone loves pizza. The startup, which was founded in Houston, made its debut at last year’s South By Southwest Interactive festival and flirted with an appearance on the entrepreneur-themed TV show “Shark Tank.” (They ultimately decided not to go on.) BeeHex’s roots are in 3D printing technology, borne out of a NASA grant aimed at developing food that could stay fresh for deep space journeys, such as a launch to Mars, which could take as many as five years. 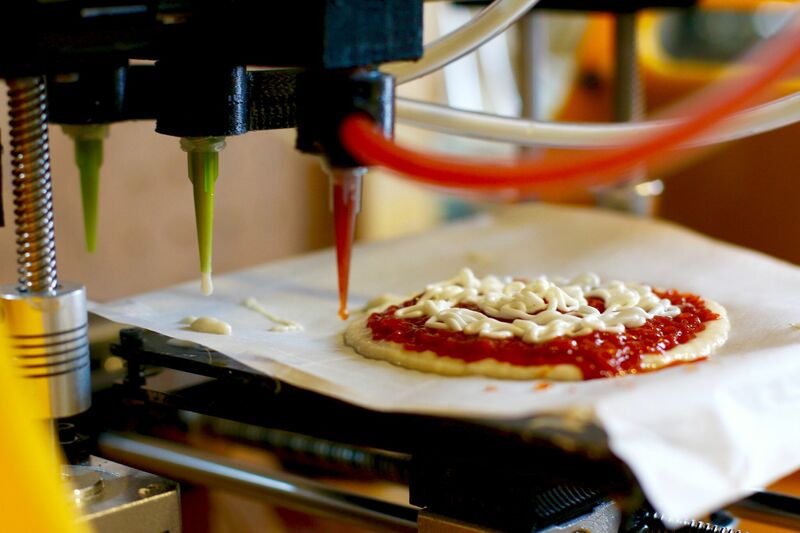 BeeHex is developing a 3D printer for food, specifically pizzas. Instead of plastics or other materials, the cartridges in this printer contain ingredients such as dough, tomato sauce, and cheese. The printer has a user interface for cooks to input preferences—thin crust or deep dish?—and software of the recipe prompts the ingredients to be pushed through extruders which, then, “print” out the pizza. An adjustable pneumatic system pushes the ingredients out of the nozzles. I didn’t get a chance to try BeeHex’s pizzas, but pictures show the pies to have a “knitted” look to them, like yarn knitted into a winter hat. The pies are then taken to an oven and cooked. Contractor says his target customers are restaurants; he’s not aiming for individual use. Targeting restaurants makes sense because, he says, commercial kitchens, like other labor-intensive industries, are looking to automation as a way to reduce labor costs. 3D food printing can allow for food prepared to meet those customized needs, he says. Low-carb crust or reduced-sugar tomato sauce cartridges could be developed to create pizzas that could meet more individualized dietary concerns. Contractor says his plan is to provide both the printer and cartridges to customers. In June, BeeHex raised just over $100,000 from friends and family to further develop its printer, which is scheduled to be available for lease in September. In the meantime, Contractor says he has a strategic partnership with a pizza company that has invested nearly $1 million into BeeHex in exchange for equity. The startup is now moving its headquarters from Houston to Columbus, OH, where the pizza company has a production facility. “We will develop product with them,” Contractor says. BeeHex, which has four co-founders and three part-time employees, is among a small but growing group of startups seeking to use 3D printing technology in food. Natural Machines, based in Barcelona, Spain, has referred to its 3D printer—the Foodini—as the “next microwave,” something that will sit in people’s kitchens and become a daily part of cooking. Users can choose a recipe from Foodini’s touch screen (or from a tablet or laptop since it is wired to the Internet) and the device instructs users on which food to put in each capsule. Foodini says its printer is currently being used by “professional kitchen users” and is expected to be available for general purchase this year for about $2,000. In London, a pop-up restaurant called Food Ink features a gourmet menu of 3D-printed cuisine. This year, Food Ink will take its 3D printing show on the road for a 22-city world tour starting in Las Vegas. Technologies such as 3D printing are “a great tease of the mind of what’s possible,” says Robyn Metcalfe, a University of Texas at Austin professor who runs Food+City, an organization that supports innovation to help create a better food system. Organizations like NASA are interested because the technology that goes into creating the materials for the cartridges can help retard food rot, extending the life cycle of food products. Essentially, the process of creating the edible “ink” from a recipe’s ingredients can not only dehydrate the material but also remove micro-nutrients that can cause spoilage or odors, Contractor says. Those micro-nutrients can be re-added when the food is being prepared for consumption. This process wouldn’t necessarily be needed in commercial food kitchens where food is being consumed quickly, but could come in handy for years-long flights into deep space. Contractor was previously senior engineer at Systems & Materials Research, the company that received a $125,000 grant from the U.S. space agency to work on the deep space mission food project. When the funding was halted in 2015, Contractor says he decided to found BeeHex. BeeHex was a finalist for the 2014 Food Challenge Prize administered by Metcalfe’s Food+City group, then called the Food Lab. Metcalfe did not have a chance to try any of the startup’s 3D-printed pizza but understands the growing interest in using the technology to solve problems along the food chain.